North Carolina Museum of History, Raleigh. N.C.
A couple years ago we led our readers on a postcard tour of the state government buildings that encircle Capitol Square. This week Flashback Friday ventures a block away, and brings you a profile of the State Library and Archives Building. Opened in 1902, the Museum of History has been a part of the Division of Archives and History since 1914. The museum moved to this modern structure in 1968. Not just the Museum of History. The State Library was created in 1812 by the General Assembly as a repository for legal volumes and documents as a resource for state legislators. The North Carolina Historical Commission, the predecessor of the Office of Archives and History, was later established in 1903 to process and preserve documents and collections important to North Carolina history. In 1914, through the efforts of Raleigh newspaperman and historian Fred Olds, the state legislature established the “Hall of History”, now the Museum of History, as the central location for the collection, cataloging and public display of historical artifacts relative to North Carolina history. Since their inception, all three agencies had been housed separately in various government buildings encircling Capitol Square. Space for each had grown so dire by the mid-1960s that the legislature proposed to consolidate the State Library, State Archives, and Museum of History into a single building suitable for their idividual purposes. The Raleigh architectural firm of F. Carter Williams and Leif Valand was hired to design the structure. Their plan called for the leveling of an entire city block, which, up until then, had been entirely residential. The site chosen was next door to the new Legislative Building, erected in 1962. 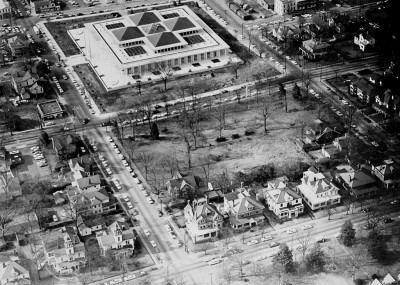 This aerial view of the block bounded by Jones, Blount, Lane and Wilmington Streets, shows the site where the State Library, Archives, and Museum Building was to be built. Williams and Valand designed a structure which echoed many of the architectural elements of the Legislative Building. These included a gleaming white marble exterior, neoclassical colonnade, broad promenade, grand reception foyer, and complementary landscaping. Work began in 1966, and was completed in 1968. Later, as each agency grew in purpose, a lack of adequate space became an issue, resulting in the museum moving to its own building on the Bicentennial Mall in 1992. 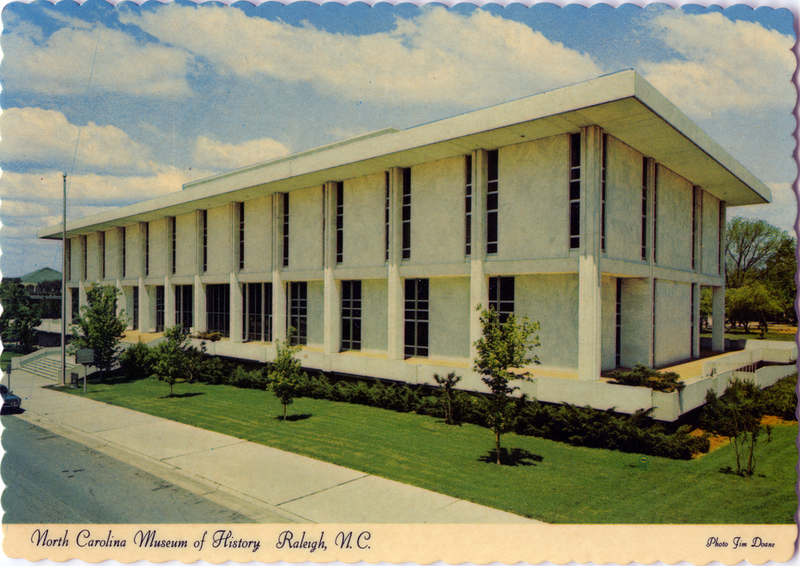 The State Archives, Library, and the N.C. Department of Cultural Resources now occupy the entire 1968 building. In 2008, the marble cladding was removed, presumably because of erosion and air pollution, and was replaced by the grey, “battered,” granite surfaces we see today. 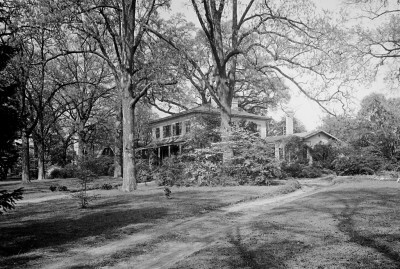 Dr. Thomas Devereux Hogg, a Raleigh businessman and philanthropist, built a handsome Italianate villa on the block bounded by Jones, Blount, Lane, and Wilmington Streets in 1850. The 16 room house featured 15-foot ceilings, full-length first floor French windows, ornamental interior plaster work, walnut woodwork, and gas lighting. On the block surrounding the house were a kitchen, ice house, servants cottages, gardens, carriage drives, and 200-year old oaks. During Raleigh’s occupation in 1865, Union officers occupied Dr. Hogg’s home, and troops camped on the grounds. Dr. and Mrs. Hogg’s daughter, Lucy, later married Isaac Dortch. Their daughter, Sally Dortch, was the last Hogg-Dortch to live in the home. Following her death in 1951, the house was sold to the state in 1957. Sadly, the Hogg-Dortch homestead was demolished in 1962. In the aerial photo above, which was taken just a year later, you can see the scraped earth where the house stood. The Archives and History building was erected on the site in 1968. Today, a single ancient oak tree still stands in the parking lot behind the Archives and History building; it is a lonely, yet lasting reminder of Raleigh’s lost history. This idyllic photograph of the Hogg-Dortch residence, as viewed from Wilmington Street, was taken about 1950. The large oak tree seen center left still stands behind the Archives building. Our Flashback Friday photochrome postcard this week was published about 1970 by Aerial Photography Services of Charlotte. It was printed by Dexter Press, Inc. of West Nyack, NY. Thank you, Karl. Thanks especially for the aerial view of what was on the lot previously. It’s awfully hard to love the Archives building when one sees what was destroyed to make room for it. Six wonderful mansions facing Blount St., along with the Hogg-Dortch House and two others. What a horrible attitude the Modernists had toward our architectural heritage. Some time ago you posted an old postcard of those six mansion. The one on the corner was built of granite, with a red clay tile roof. It was finer than any surviving house in Raleigh except for the Governor’s Mansion itself.